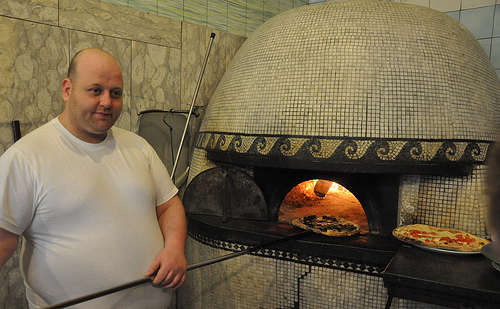 Five days in Napoli and five pizze Napoletane. There are many reasons why I love Naples – the people, the chaos, the pastries, and yes, the food. Especially the pizza. This trip I dedicated part of each day to pizza. Yes, each day I ate a pizza, a classic margherita or Margherita D.O.C. at five different pizzerie in Naples, my own little pizza lover's odyssey. 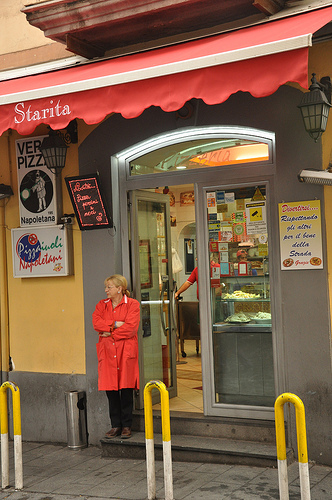 Love Neapolitan food and its region? – Join me and taste and cook the best pizza, pasta & pastries this region offers on an 8-day/7-night all-inclusive vacation to the Amalfi Coast! 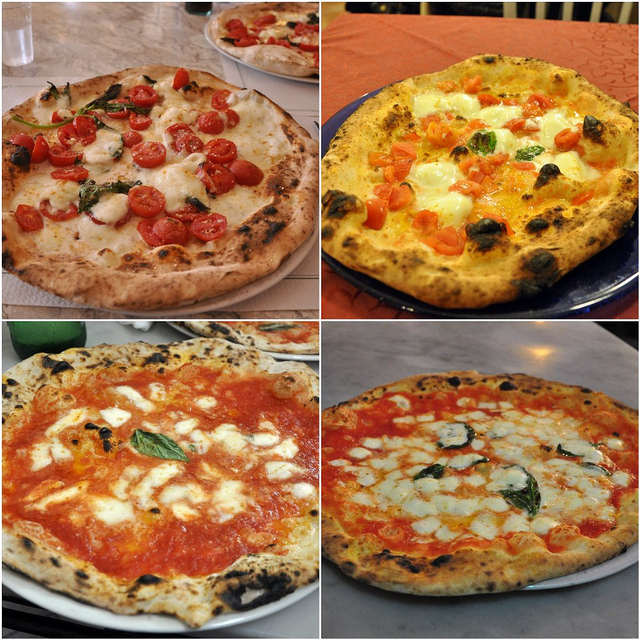 We'll definitely be tasting and making Neapolitan pizza during this vacation. VPN guidelines: The guidelines cover more than just the ingredients. There are rules about oven temperature (surface temperature must be 905 F), how long the pizza should cook (60-90 seconds) and even what type of pizza peel can be used. Many might find this tedious, but I see it as a love and dedication these artisans have for what they do. 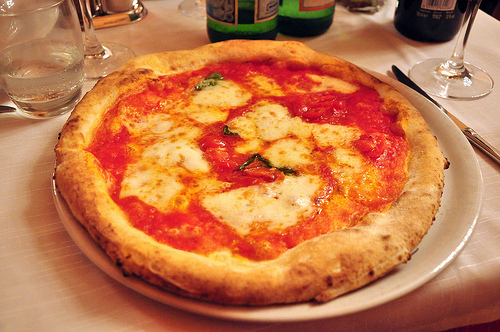 Below are some details on making the dough and making one of the classics – the pizza Margherita. The dough – For the VPN dough, there are four ingredients: water, salt, yeast, flour (type "00" and up to 20% may be type "0"). I'm a little confused about a 5th ingredient because the guidelines state that "all types of fat must be excluded from the dough;" however, it is widely accepted and admitted that lard is a key ingredient in the dough. 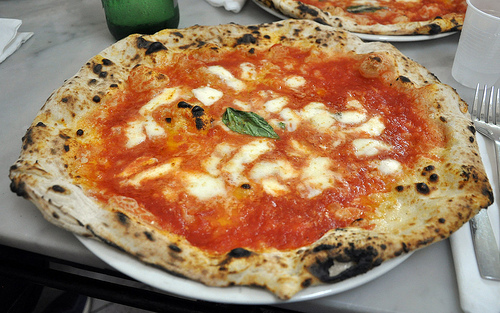 The VPN also gives suggestions for quantities to be used for each ingredient, but each pizzaiolo can and does determine his unique recipe. 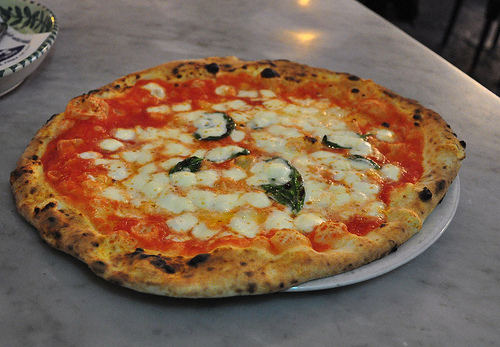 Pizza Margherita – A classic Neapolitan pizza, this pizza with the tricolore of the Italian flag was made in 1889 to honor Queen Margherita, who was visiting Naples. A classic Margherita has sauce from San Marzano tomatoes, fior di latte (cow's milk "mozzarella" cheese), olive oil, sea salt, and fresh basil. There are also guidelines as to the amounts of each ingredient and how it is applied to the pizza "base" (the dough). I think it’s hilariously ironic that Italy is all into the trend of giving culinary stamps of approval and guidelines (compare wines: Vdt, IGT, DOCG, DOC). It’s a bit absurd (to me) since I never knew two Italians make things the same way … as this experience/post demonstrates! But I guess it also shows how creative Italians can be while using the same ingredients!! This post will come in very handy if I every actually make it to Naples … I’ll just bring it along and follow the “tour”!! P.S. Starita’s looks the best to me, yum! ps. cute photo, bet those guys were lovin’ the attention too! These pizze challenge everything you think you know about pizza. My Italian friend with the restaurant gave me an abridged lesson in the history of pizza and it’s fascinating when you learn of its origins and how commercialised it has become! Amazing reportage, Kathy! It’s interesting for me to see a side-by-side comparison and notice so much difference between the different styles. 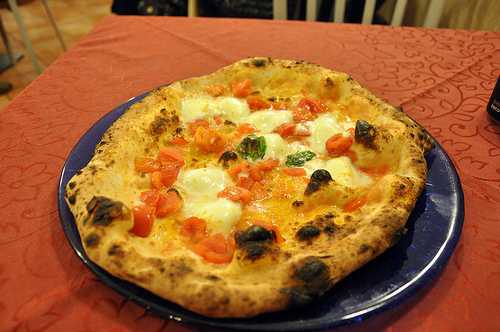 I’m from Northern Italy, and the Neapolitan pizza that I know and love is the one made by southern immigrants – which I find tends to look a bit like Sorbillo’s. 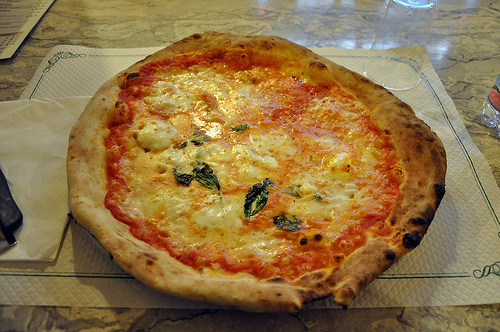 The more common, non-Neapolitan alternative in Milan has a much thinner and crunchier crust, and the cheese covers uniformly the entire surface. Paula – I understand your point. As with many dishes, it’s more than just a recipe. The pizzaiolo’s skill (and how much of the supposedly “forbidden” strutto/lard he adds to the dough) plays an important part in the whole thing. I really wish I had tried the D.O.C. version at Sorbillo to see how it compared to Starita…yet another reason to return. Tuula – When you go, let me know what you think. Pizza preferences are all so subjective. Being that I was at Trianon on a rainy Sunday when all the “good” Catholics were at church, it was pretty slow. I did cause a little scene near the oven when trying to take photos. Mainly, they couldn’t understand why I didn’t want to be in the photo. I even resorted trying to joke (in Italian) that I would break the camera (they didn’t get it). Corinne – I so agree. I initially thought they must all be realatively the same. Actually, I would have loved to try more, but it was really impossible. A pizza a day for five days is a lot of pizza. Paolo – Thank you! 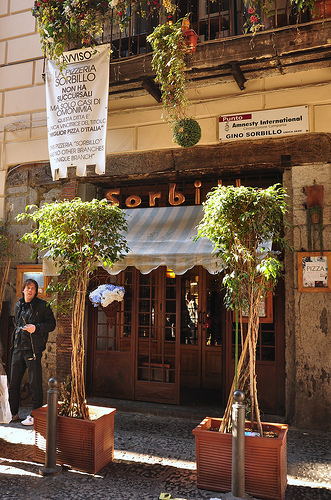 From what I’ve seen, I would say that Sorbillo’s is the quintessential Neapolitan pizza. I have to say that I’m a fan of the thicker border and more chewy crust of the Neapolitan pizza. There is a VPN pizzeria where I live in SLC, UT. My husband lived in Naples for a few years. 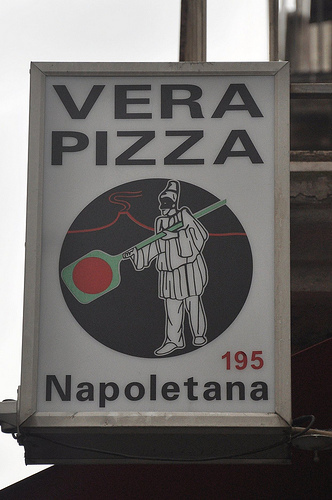 When we went to the pizzeria here, he kept telling me it took him back. It was exactly the same. 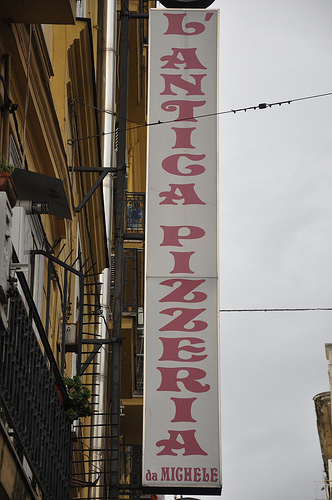 It was delicious, but I didn’t really understand the significance until we went to Naples and I was able to savor the goodness of the pizza there. WOW! I want to go back so badly! 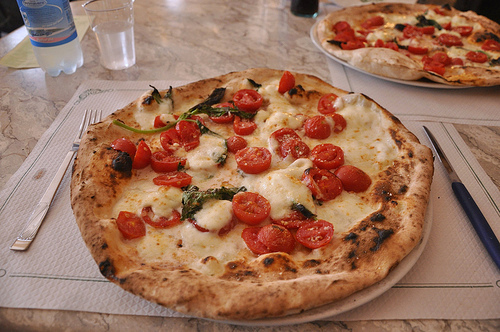 Seeing these pizzas makes we want to jump in my car and drive to Settebello! I’ll take it until I’m able to go back to Naples! BTW-I’ve bookmarked your website! Thank you!